The signs show what the ring is made of. 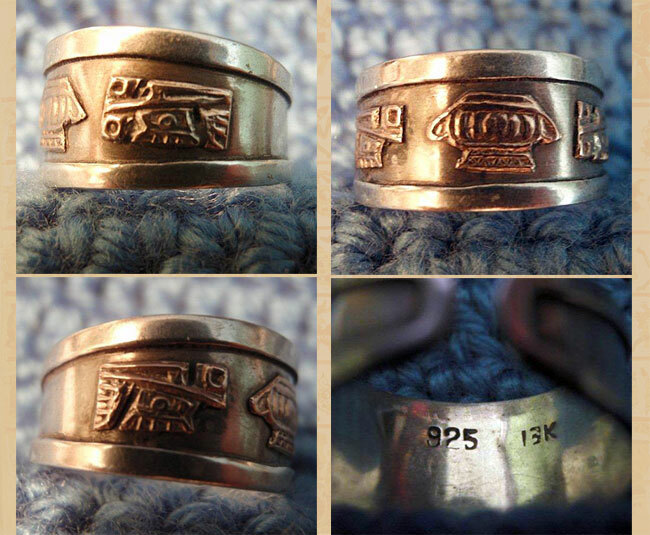 925 means it is a silver sterling ring (the interior does seem to be silver). 13k should mean that it has a 13 karat gold plate. As to the symbols, the later one looks like the so called “toltec dragon”, but who knows? Pretty ring BTW. I can’t tell if it’s gold or bronze, but if it’s bronze I believe this ring might be from one of many communities of Michoacan (Purepecha). Symbols don’t mean anything. Just random objects.